Destined to be the gold standard for 10" left tilting Cabinet Table Saws, this saw will be the focal point in any shop. Every part of this saw says quality and performance. From its heavy cast iron trunnions, 3 HP motor and triple belt drive to its massive cast iron table and wings, this Table Saw should last a lifetime. You’ll also appreciate its camlock T-fence, riving knife, heavy cast handwheels, magnetic switch, T-slot miter gauge and 4" dust collection port. This saw is what dreams are made of! CSA certified meeting CSA C22.2 #71.2-08 and UL 987 standards. 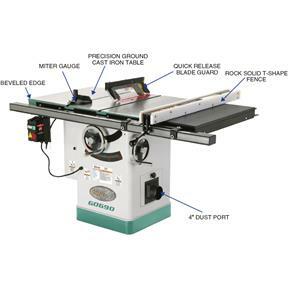 Table size with extension: 27" x 40"
Maximum depth of cut @ 90°: 3-1/8"
Maximum depth of cut @ 45°: 2-3/16"
Distance from front of table to blade at maximum blade height: 12-1/4"
Distance from front of table to center of blade: 17-1/4"
Includes 10" x 40T blade and H3308 Push Stick! Great saw, very solid and cuts perfectly. Grizzly's customer service is amazing however the freight company SAIA sent my saw 5 hours away by accident and it took them 4 days to get it back to my city. I bought the G0690 a month ago and used it straight out of the box with no adjustments. Works perfectly! Used it to build a 15 drawer dresser. Very happy with it. Plenty of power and runs smooth.. Solid piece of equipment, I am extremely happy with my purchase. It is a true joy to use this saw! Excellent quality on all products. Staff managing phone order was a pleasure to work with. I'm really pleased with this saw, upgraded from an old Delta contractor's 10" saw that I've had since the 1980's. Good power, well finished surface, nice fence. I have only had the saw for a few weeks but I cant imagine life without it. I am very impressed with the quality and attention to detail that has gone into this machine. You get a lot for your money, and I couldn't be happier! Recently purchased, haven't used it much but so for it has been great. Great saw and a great price. Cuts clean and accurate almost no dust. Highly recommend. Saw was well packaged and in perfect condition upon delivery. Was ready for use with minor adjustments. Really well thought out instructions for set up and use. Have had the saw for a month now. Assembly was straight-forward with minimal set-up adjustments required. Only suggestion would be to to have a longer power cord. Saw has a lot of power, cut 2" oak with ease. Wish I had upgraded a long time ago. Purchased this saw in early July, and after waiting for a 220V service to be installed, I began using it a couple of weeks later. It is so far superior to my BT3000 Ryobi contractor saw, that it's been banished to the barn. The main saw box arrived in perfect shape. The fence box was punctured in two places, but the contents were unharmed. I swear that the UPS loaders or final delivery "partners" must take offense at the word "FRAGILE". At any rate, every part of the setup went well, and the Bear Crawl base has worked out very nicely. I made a riser of four pieces of 1 1/8" sub-floor plywood about 2 inches larger than the saw base, screwed together with 4" construction screws. I lifted the saw by one end and shoved the base in about halfway under. Then just pulled it up and aligned it, screwing it down with 3 inch construction screws. I removed the tilted inside floor to screw the saw down, and when I replaced it, I sealed the edges with sticky foil tape. Then, I just followed the directions from the Bear Crawl manual and everything worked out great. I assembled and mounted it myself. I raised it because I'm 6'9" and, of course, everything in life involves some sort of compromise. The saw wings were fine--just one strip of masking tape leveled the left side wing; the right side was fine. The extension wing mounting holes were slightly off, but not enough to cause any issues. The fence took a bit of fiddly work to get the damned thing square, but I persevered. Squaring the blade to the miter slot was a matter off measuring--it was perfect (within 1/64"; beyond my skill level at this point). I used it to finish the Port Orford cedar box I built for a friend's deck furniture covers, and it was a joy to use. I also used it before it was on the mobile base to rip the risers, and since then for the same type of risers for the mobile base (Bear Crawl) for the 17" 35th Anniversary band saw I bought from Grizzly during the recent promotion. I am happy with everything so far. Next, there's a drill press and a shaper in my future--from Grizzly, of course! In the next post, I'll post some pics of the table saw and band saw. Delivery came fast. Assembled in around 3 hours including adjustments. A small knob was missing and one handle was defective. Called Grizzly and they sent the 2 parts our asap. Saw works great. I cut a lot of inch and a half hardwoods and it cuts effortlessly. I'm proud to have it in my shop. Thanks Grizzly! I knew that this was going to be a great saw, before I bought it. But, I didn't know it was going to be this great. It is a beautiful machine! I expected the cast iron to be coated with cosmoline to prevent rust. But to my surprise the surfaces were covered with an oil-like, impregnated paper that was not messy at all. When I pulled the paper off of the top of the saw it revealed a beautifully finished surface. I also purchased the router table extension. The box was so torn and taped that I thought for sure would contain a bunch of broken parts. I was wrong. The contents were all there and un-damaged. This is a heavy, robust piece of equipment. I plan on purchasing a Grizzly edge sander next. I am a very happy Grizzly customer. Cutomer support for replacement parts required to repair broken weld was flawless. Communications concerning where I could pickup the saw, was the only issue. Delivered to the wrong UPS terminal over an hour drive away instead of the one close to my home. The product arrived very promptly but had obviously been in stock for quite some time and may have tipped over at some point. The case of the product was racked or twisted a bit upon receipt. This was obvious because of the gap with the motor cover on the top side. After some effort the issue was resolved and the case straightened to allow the cover to fit as intended. Next issue was the spots of rust on the main table top. When unpacked the paper cover that was over the top was totally dry and fell right off when unboxed showing sever spots that started to rust. The product works fine but disappointed with the issues with the product upon receipt. The box holding the fence was a mess and completely ripped open on one end, loose parts clearly visible. When unpacked the part of the bracket on the front was bent and had to be straightened before it could be assembled onto the rail. The only box (of three) that arrived undamaged was the one holding the rails. I had this older Craftsman for at least 30 years. I'll not knock it because it did what I needed done (limited, occasional use). But, I built a new workshop, and wanted something better. After researching and reviewing most of the other well known saws out there, I decided to go with Grizzly. When I got the new Grizzly GO690, I never dreamed how much of an improvement it would make in all the various uses of a table saw. My only reservation is that I seem to get more dust out of the top end than what I expected, and that's with using a 2 HP dust collector with good suction. Even so I will still give it a five star rating, and am pleased with my selection. So far nice saw , basically the saw well pkgd. The one area that pkg could improved is the fence box , upon receipt of saw, box was damaged . Ups guy waited till contents were checked for damage . Fence itself ok but sight glass attached to fence damaged . Fence slides inside of box and pokes hole at end due to lock lever . Grizzly is sending me new sight glass . They quickly respond to questions and claims . Great customer service. Only other complaint about the saw would be the short power cord . Still very happy with grizzly products as I have the thickness planer too and it's a great machine . My very first cabinet table saw and what a treat.everything they said , i.e. fellow woodworkers, was right on the money. Quiality and value are apparent in this very fine product. I have a jet cabinet table saw 3HP that I bought 15 years ago. The fence on it never worked to my satisfaction so I replaced with an incarna. I purchased thiis saw for my new woodworking shop and so far so good. The fence is very nice and I like the ease of the on off system etc. it seems to have a little more viberation than my Jet but it is sitting on a mobile base that I think is causing some of that. I haven't hooked up the dust collector yet but so far I am extremely pleased. I have had great experiences with Grizzly power tools. Have purchased two jointers and now this table saw. We have installed this saw in our shop, and got it up and running very quickly. We have not used it much yet, but it appears to be heavy-duty, well-made, and cuts very well. We are very pleased so far. This saw is everything that I thought it would be. I've made several jigs for it already and have been having a great time with it. It's really going to up the game in my shop. The G0690 is a well built machine and met all my expectations. Set up was a breeze and all alignments were dead on after putting the machine together. I considered many other brands but grizzly stood out do to the availability in parts, price and just a cool looking table saw. The G0690 replaced a hybrid and contractor saw. I have no complaints with the grizzly. You get what you pay for and this is definitely the case with the G0690. It's solid and cuts straight. I installed my router in the extension so the fence could be used with the router. It works perfectly and has eliminated my existing router table. The saw runs quiet and has plenty of power. This is definitely a professional piece of equipment that will last a lifetime and then some. This saw lives up to all the other reviews out there. Great value, great saw. Was surprised by the allen key set, saw wrenches, and the two (2) table saw inserts (regular and dado stack). Only issue I have is with the power cord. If you reference the manual it recommends a minimum distance of 30" away from any wall in order to open the motor door. However, the cord isn't long enough to accommodate this distance without it becoming a trip hazard. Ended up purchasing 25' of power cord along with some terminal connectors. Reference youtuber: "Unemployed Redneck Hillbilly Creations" he has probably the best review I have seen on unpacking, set-up and review of a grizzly table saw (G1023WRLX). Make no mistake, I'm very happy with the saw but getting it took some doing. The order process was great but delivery was another story. Grizzly isn't to blame here but UPS lost it and when it did finally arrive, the rip fence was bent so badly bent it couldn't slip over the front rail. I saw another review with the very same type of damage only mine was much much worse. When I called Grizzly they were very responsive and reacted quickly but I am a little disappointed in how they decided to resolve this matter. Instead of sending me a complete and new rip fence assembly, they sent me the rip fence frame. I had to salvage all of the hardware from my damaged unit and rebuild/reassemble a fence from parts. Not a huge deal but a little bothersome after the delivery process issues. All in all, still very happy with the table saw and the customer service at Grizzly. After much research, I purchased the G0690 to replace a Jet contractor's saw that was unreliable in 'staying put' with height, angle, and fence adjustment locks. I've been very pleased that I've experienced no such issues with this saw. It was not necessary to make any significant adjustments to alignments. I did 'drop' the height of the rip fence about 1/16". Everything's square/true. It's a joy to use. This is a heavy weight saw, instructions were great and saw went together as shown. The tuning of the saw was flawless and went by the book. Only one strip of masking tape was needed to bring top into specs. I had removed top to ease moving saw into shop and had no trouble getting it aligned to blade. I purchased this saw to be the center piece for a new wood working shop and it looks great.. I would rate the initial saw performance 4 stars, delivery and initial quality as 3 stars. Have not used the saw enough to fully review its performance, that is the reason for 4 stars, instead of 5. I have used it enough to saw it is waaaay better than my old contractor saw. This saw is Smooth, accurate, powerful. The delivery from UPS FREIGHT took an extra week, total of two weeks. UPS would NOT provide any delivery window. Since i had to be gone for two hours on the first day they could not deliver we had to reschedule for the next day. The next day their tail gate mechanism broke so around 10:00 they called to cancel. Next day they around 10:00 they called to cancel because of snow. At the same time they cancelled the day after that because it might snow. The day after that they cancelled (again around 10:00) because their the truck turbos broke (whatever that is). Finally the day after that they delivered. UPS freight policy is that they will NOT deliver to a cul-de-sac. I live on a cul-de-sac. My previous 2 grizzly machine orders i paid extra to have a different carrier pickup from UPS and deliver to me, and place in my shop. Both times UPS showed up with a full size semi and delivered. This time i gambled UPS would show up with the full size semi and place in the garage. Sure enough, full size semi. Again i got a great truck driver, but this time, since i didnt pay for white glove service i was able to give that money to the driver as a generous tip to place in the garage. Sumarry of UPS FREIGHT is the company policies are TERRIBLE the truck driver are TERRIFIC. Assembly was straight forward. Manual mostly accurate. Wish they would provide more info about adjusting the riving knife. It is a Very tight space to perform a blind adjustment. The biggest issue i had with the assembly was the rip fence itcould not be adjusted within .1 (yup one-tenth) of parallel with the blade. After examining the fence i found it to be bent. Since the box it came in was in good condition i can only believe it was built that way. Grizzly true to their customer service reputation agreed to take care of it. Unfortunately since they had none in stock it took an additional two weeks to deliver to me. UGH very frustrating. Essentially i paid for this saw a month before i could use it. The photos sow the difference in measurements between the left and right side of the fence. They also the roll ( compared to a straight edge) on the fence, where the bend was. After all of this i am starting to enjoy the saw. Ive wanted a cabinet saw now for several years however the prices of this type of saw kept me wanting. When I finally decided to take the plunge I wanted to make sure I spent my money well...I researched every review and YouTube video I could find for every brand and model available. The Delta Unisaw was always in my opinion as the gold standard, however the new saws are getting negative reviews for quality (Delta was sold off). The SawStop got rave reviews for the quality, however the costs are astronomical and people are reporting issues with green wood activating the brake mechanism. Each time the mechanism activated you have to replace the cartridge and the blade...worth it if it activated because you stuck your fingers in the blade...but erroneous activations get expensive quickly. 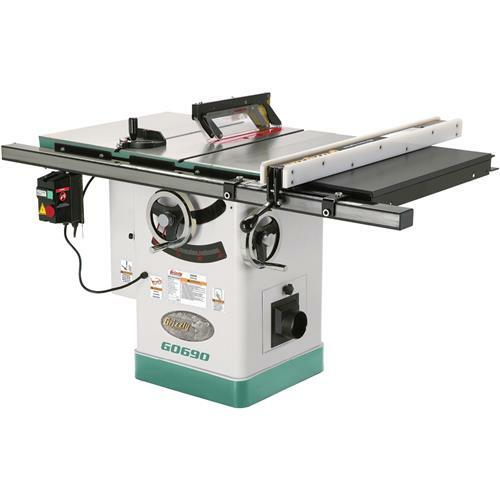 The G0690 had good reviews and the price was reasonable, especially compared to similar saws. This saw had everything I was looking for so I pulled the trigger. A lot of the other reviews talked about damage to the boxes when it arrived, which made me hesitate but each person that had issues talked about how great Grizzly was in customer service, something else that Delta lacked. When the truck arrived to deliver the saw, the driver opened the trailer door and my heart sank...the box was absolutely destroyed! The driver was excellent and actually rolled the saw down my driveway and into my garage. We cut away all the damaged packaging and much to my surprise, only damage seen was a tiny scratch in the motor cover, less than a 1/4 inch! Set-up was simple if you follow the directions. The blade was true to the table, fence was simple to calibrate and I only had to use some masking tape to shim the wings. One of the other reviews I had read talked about only using 1 piece of tape as directed...they were right. I first put on two thinking that it looked like it would need more but ended up removing the extra. They say use 1 piece for a reason!! So nice to have a good saw that is true and accurate! Makes woodworking so much more fun when you have the right equipment! This saw isnt the best of the best, but for the money it cant be beat! It also comes with a dado insert, which was nice. They actually sent me two standard inserts instead of a dado, but I called them up and they shipped a dado insert out right away. One last thing, the president of Grizzly is a woodworker himself and his work can be seen on their website. Its reassuring to me to buy equipment from a company that understands what we need and uses the equipment himself. Overall, my experience has been more than pleasant and Im extremely satisfied with my purchase. Very happy with this product. The fence is accurate to 1/64" Definitely recommend a mobile base for this saw. I wish I had this saw 3 years ago when I started my business. It speeds up my production. I purchased the G0690 cabinet saw a couple of months ago. Everything shipped as expected, but unbolting the saw from the pallet was a bit of a chore. I went with the ShopFox mobile base for my unit which has worked out great. Overall, I love the power, size and product quality. Mine vibrates a bit more than I thought it would even though everything is tightened up real good. The nickel test just doesn't work for me. Also, the vast majority of the dust does fall into the cabinet which is nice, but I still get a fair amount of dust on the table. Not a big deal for me, but I just don't know if that's normal or not. I would definitely recommend this cabinet saw to anyone looking for a high-end unit, but without breaking the bank. 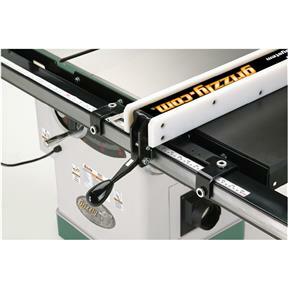 I purchased the Grizzly G0690 table saw to replace a common 25 year old contractor saw that I'd been using. I've found the G0690 to be very well thought out and well made. As with any shop tool, some effort is required to get everything dialed in. Getting the fence squared up took me longer than I'd like to admit, but once I had done so, it is very predictable and accurate. Powerful motor. The cabinet and cast bed are heavy enough to dampen vibrations. Good fit and finish. Ordered the saw on a Friday and it was delivered the following Tuesday! Amazing shipping time for my area! Normally takes 5 or more days to get any order let alone a heavy freight item! Saw was very easy to set-up and works flawlessly. There is no comparison between the 220 3 HP and my old 110 1 HP. Electric was very simple to hook-up! Very happy with my purchase! Very impressed with the unit. Even the packaging. Hardly any Styrofoam--cut the banding and the whole box falls away! gauge when adjusted snuggly in the slot seemed to drag in places with saw dust present. Unit does pass the nickel test on vibration. nor have I ever used a saw with a riving knife before. The white polypropylene fence rail only varies .002 in thickness from front to rear. have to be the saw blade insert. It needs improvement on flatness and the rear adjustment screw. Will probably replace it someday. two to three times more, you couldn't tell the difference. So far this is a great product. Assembly directions were very accurate and easy to follow. The only adjustment I had to make was for the cast iron wings to be perfectly flush and straight with each other and the main body. The directions walk you through this very well. When they tell you to shim them up or down with a strip of masking tape, believe them. It doesn't take much! I did not have to adjust anything else but the directions to do so are there in very clear language in the event that I have to in the future. Cross cuts and rips oak as if it were pine. So far I am very pleased! I have been able to fine tune my cuts to at least +- 1/64 of an inch just after setting it up. I know this will improve with more cuts. Glad I bought the saw as its a good deal for the money. Its been 22 days ago that the saw arrived and finally have the needed parts to get the saw up and running at last. Good cust service department but slow to get needed parts out to you. Beware ,buy a new saw to have to repair it be fore you can use it for the first time. Just got this table saw about two weeks ago. It is perfect. I love how it hums. Used it too cut plywood sheets for cabinets in the garage. Accuracy is amazing. Can't say enough good things about it. It's such a pleasure to have a high quality, stable tool with such predictable results on every cut. Wow! Incredible saw. This replaced a craftsman contractor table saw. The G690 is a dream to setup and use. I am amazed that this saw makes that much difference in the quality of my woodworking projects. I purchased this saw a few months ago. And I love it! This love affair didn't begin when ripping 3" hard maple or cutting dados. It began during the assembly. Out of the box.... saw blade miter slot alignment....within .002. Two Cast Iron table extension.....no shims required. Tighten bolts enough leaving a little room for flushing...complete the tightening. Done! There is one point about this machine as well as others that is not often discussed , and that is its electrical components. It seems years ago that all 3HP induction motors required a 30a breaker. Many of these machines now only require a 240v 20a breaker. 30 amp requires 10ga wire, where 20 amp only requires 12ga wire. For me, this is a huge benefit. One man shop, one tool at a time. Unplug one plug in another. All future high voltage machines will have to meet this requirement. Next upgrade? Dust collection. This should be our first consideration, but never is. I am determined to spear no expense in purchasing just above what I require. Happy working to all! ps Great Saw! Excellent saw with easy setup for ready to go operations. The packaging is heavy enough to provide you with a damage free product and shipping was fast from Bellingham WA. Alignment was dead on right out of the box. Thanks for a great saw for the money. I plan to get many years out of this saw. I got this to replace the 0715P. I love it, dependable, accurate, powerful enough for my purposes and then some. I have used this saw daily since I bought it. It is an Exellent saw! I had a few questions during my assembly and the service and assistance was equally Great. Thank you very much for selling a saw that will, I'm sure, last for a life time. I got rid of a 13amp skill table saw on a flimsy stand and Got this one so my review might not be as accurate as an experienced woodworker. That being said, To me this saw is amazing. It is super smooth and stable. Very powerful. Heavy enough to stay stable when cutting, but it's not too heavy to move around a little if i need to so i opted not to get the mobile base. I bought this saw six weeks ago and love it. Everything I read about this saw was true. The saw performs like a champ. This is a serious piece of equipment. It took me about three hours to set it up by myself. Would be better to have someone to help you. I LIVE IT. My saw came in last month and I finally got a few weekends to set it up, install a router table, and check run out on the miters, fence, and blade. The fit and finish is great with the exception of the cabinet cover latch. I appears the tack welds that held the latch onto the cover broke leaving the cover to flap around once I got the cabinet unboxed. A quick drill and machine screw took care of it, but it's an inconvenience. That's the only thing preventing this from being a 5 star rating. Fence runout is about .005" from front to back with a blade runout of .003". The vibration is minimal with the machine passing the "nickle test" easily on starts and stops. I've cut some plywood and 2x12s so far for building shop furniture and the saw doesn't blink an eye. I've yet to start working hardwood on it though but I have no doubt it will handle it with ease. I put the entire unit on a Shopfox D2058A portable stand with a 1300lbs capacity to make it easier to move around the shop. All in all I'm well pleased and can't wait to put a dust collection system on it and start checking projects off my list. Went together easily. Table top was very true, both wings have a 20 thousandth dip from side to side which i can live with. Tracks were very parallel. Very happy with the fence. I have only had the saw for a short time now. I had a couple of issues with delivery and set up. The fence was damaged in shipment. Grizzly should remove the "Fragile, Do Not Drop" sticker from the boxes. I think that is just a challenge to the freight companies. Every box I have received via motor freight has been damaged. In most cases, the interior packing is enough to protect the tool. The blade guard did not line up correctly. It was determined that one part had been manufactured incorrectly. In all cases, Grizzly customer service was super! All problems were addressed immediately and replacements were shipped the same day. I set up the saw with the help of my son. There is nothing light about this saw. That's what makes it so great. It took us a couple of hours to assemble. I spent several more hours fine tuning. The riving knife/blade guard adjustment is very time consuming, but with patience, it is right where it needs to be. Had an issue with hole alignment in the outer laminate table extension. With a file, I was able to open up the holes enough to get the bolts in. Started the saw. The power! Wow. Nothing like my old Craftsman contractor saw. I have mostly only been cutting pine boards so far. No difference in tone of the saw. I did cut a 5/8" x 2" rabbit in poplar for a window sill. Again, the saw had no problem. The blade that came with the saw is okay. I just bought a Freud glue line rip blade and will expect perfect cuts. This should be the last table saw I will ever own. Now I just have to talk my wife into letting me buy all the other tools I want. I bought this saw about 4 weeks ago it is amazing, easy to assemble with great instructions, no big adjustments needed to be done. The fence is wonderful it was .002 tolerance from the blade which is fine by me. Working with 8/4 maple and it has enough power to cut without bogging down, I think the Freud blade helps a lot to. It is a great saw and I would recommend it to any one. Bought this to use as a production machine. Arrived undamaged, (well packaged) very easy assembly. This saw is so smooth, powerful and dust collection is great! Used for ripping, finish panel cutting and even slicing 1.5" rigid insulation. More than enough power, heavy enough to be rock steady. Great placement of stop switch. Fence has not been tested with power feeder (yet), but has stayed in place when cutting 4'x8' 3/4" sheets. Highly recommend. I haven't had a change to use yet, took it out and checked it out , put it back in the box , rebuilding my shop suit will have a place to live. Look forward to using it. This is an awesome saw, and I'm really happy with it. I gave it 4 stars because I do have a few issues with it. The saw cuts like butter(Freud P410), and that was 3/4" hickory; no saw marks, no burning, just a nice clean cut. The dust and chip collection leaves something to be desired even when hooked up to a dust collector. The big problems I had was there was a very tiny ding in the main table surface, but I figured sending it back would be more trouble than it was worth. The other issue is the wings don't line up perfectly with the main table. They have a few thousands of sag in the very center and try as I might I couldn't get it lined up. But again I didn't feel like this was much of a problem. Overall, it's been a good saw. A lot of bang for your buck. And if you're on the fence between this one and the other grizzly, well I can't help you there, so was I.
Holy Cow this has been a real roller-coaster. I love my saw, it's a really good product; I have been using it extensively since I've gotten it up and running. But, getting to that point has been difficult. When this shipped it was sent with the wrong fence. Not a lower quality fence by any means, just one that wouldn't fit to my saw. I got the proper one sent and it got me up and running but the delay put me behind on work. I've caught up since; However, I let bygones be bygones and didn't think much about a simple shipping mistake. I've recently purchased the long rail kit and extension table to increase capacity on my cuts. But the parts I received appear to have been a return item that was resold to me. Parts are missing, packaging was barely holding together; but worst of all there are deep cuts in the rear rail that prevent it from being usable. It's like it was notched out for miter clearance on a different saw and bolt holes were enlarged. I have yet to be contacted after making my initial complaint, but I'm getting a little suspicious about the quality of warehouse shipping and receiving at this point. If at all possible, you should deal directly at the warehouse and inspect what you are picking up before leaving. Saw was delivered in less than a week, and simple to assemble. Performed minor tuning, and it was up an running. Only negative is the fence, the adjustment devices are not precise and achieving and maintaining rip alignment is a bit of a challenge. So be ready to fuss with the fence, but overall this is a great value, and likely the best saw you can buy for the price. I bought this saw to replace an old Craftsman and I'm sure glad it did. 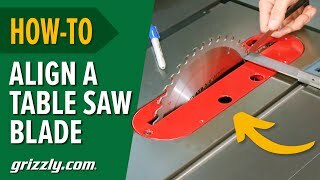 This saw works great and makes cutting wood so much easier. Another Great product by Grizzly. Really very happy with this purchase. Spent a lot of time researching table saw and this kept coming up for best bang for the buck. Great machine so far. Love it best decision I made. This Saw is an excellent value and quality is top notch. Will expand my Shop with products from Grizzly in the future. Highly recommended when you are on a budget. As we know, the cabinet table saw is a foundational tool for any serious well-equipped shop -- so I looked at every table saw available in my market -- including oldies but goodies that were great saws at great prices but most used saws lacked at least a riving knife, so for safetys sake they werent an option. In the end I bought the Grizzly. Are there better saws out there? Of course, SawStop is a Ferrari, Powermatic are great, Jet and Shop Fox look like they might have been made by Grizzly -- but in my area, the Grizzly was the best value, quality and performance combination by a long shot. Plus, so far, customer response and service has measured up to their stellar reputation -- something that drove me away from Delta after years of loyalty. The Experience: I placed my order online and the receipt said I could expect to have my saw delivered to the curb within a few weeks. So, when I got the heads-up call from the shipper that it was coming 3 days later I was caught a bit off-guard -- but pleasantly surprised. I was more than ready to mothball my old saw and get the Grizz up and running and get into a few serious projects Ive been putting off until I had it. Delivery was professional and courteous and the guy helped me dolly it into my shop. Everything arrived extremely well packaged and damage-free. Assembly: I waited for brother Joe to have time to assist -- assembly is a two-man job -- and two days later got started. In the meantime I unpacked and cleaned everything -- a good coating of protective film covered every bare metal part and a light oil coated the rest. The bare metal stuff took 4-5 passes before I felt they were really clean. Cleaning allowed me to really see up close how beautifully finished everything on this saw is -- from the lustrously machined top to the automotive quality finishes and top quality precision fits -- this saw is impressive. The rolling stand it came with (a Shop Fox) is extremely robust and over-built for the saw. I suspect it might support twice the weight -- and its a breeze to put together and rolls well. It did required a 1" wood spacer to fill a gap at the back of the saw for a snug fit -- no biggie, and better than too small. The saw itself went together logically and precisely and aligned to the highest professional woodworking standards without a hitch. NOTE: Ive read some commentary that the wings are difficult to align to .0000001 tolerance and not finished as well as the tabletop. First, this is a woodworking tool and NASA machine shop tolerances are not required for the most exacting work, and secondly the machining of the wings is smooth, flat and true -- and while they dont have the same luster as the tabletop, they are perfect for the saw and still aesthetically pleasing. The entire process from base to fence took about 3 hours and was easy -- even if youre not mechanically inclined. Alignments: Out of the box, the blade stop settings at 90º and 45º were spot on using my Woodpecker alignment tools -- pretty impressive after shipping by truck across several states -- so I suspect it will hold alignment quite well rolling around my shop floor if I have the need to move it. The table was slightly out-of-square to the blade and was easily remedied by loosening the 4 external bolts securing the top and giving it a few black-and-forth raps with a rubber mallet until it was perfect. The wings leveled perfectly without the need for micro-shims. The fence -- heavy and every bit as well built as my buddys Biesemeyer -- aligned straight and true following the directions (yes, some guys do that). Im hoping it holds up over time as well as his. Make certain when you place the adhesive tape on the rail that you center the adjustment slot of the red line indicator to allow movement either way to allow for blade changes or the use of a sacrificial fence. I didnt even take the mitre out of the box as I use an Incra (best mitre on the market) so I cant speak to that, but it looks sturdy and well-made. Performance: The most important aspect of any tool is how well it does its intended job. I got a piece of 2"+ oak off the wood rack and hit the start button. The sound of this saw powering up took me back to my first job in an industrial shop -- impressively smooth and strong. It hums without excessive noise. The fence glides silky-smooth along the full length of the rail and locks in at the tape markings precisely and positively without the tiny jump that affects many other fences. Rip cutting the oak first, it fed like a hot knife through buttah with no detectible bog and the finish cut came out nearly glue-ready -- 1" wood does come out glue-ready. I did upgrade the good blade that came with the saw to a Forrest Woodworker II 40T .125 -- hands down the best dual-purpose blade available. I also use a Freud LU85R010 10" if Im doing repetitive cross-cutting or I need the most perfect cross-cut possible in challenging-to-cut materials. Cross-cutting delivered the same effortless, satisfying results. SAFETY NOTE: One of this saws strong points, that allowed me to choose it over the SawStop, is the robust saw guard system and power. I never operate my saw without one of four precautions in place -- the full saw guard assembly, the riving knife, the precision cross-cut sled I made to fit this saw, and my fully-focused attention to the task at hand -- ignoring every other distraction. Sufficient power to muscle through difficult material -- dense or knotty wood or wood that might contain hidden moisture pockets -- makes any saw safer to operate. Binding or bogging down is a scary experience you dont want midway through a cut. And while the SawStop appears to eliminate many of these risks, I fear that placing too much trust in technology might make one complacent and a focused process/ procedure is by far your best safety asset. Plus Ive heard the stories of the cartridge engaging from moist or difficult wood and at roughly $150 a pop between the cost of the cartridge and a wrecked, high-quality blade it can get very expensive (I know -- what cost a finger?). Then there are the guys who turn off the technology in hopes of saving a buck and essentially having a saw that is no safer than my new Grizzly. All in all, Im a big fan of this product and company. Im theirs to loose. So for a while I had been doing all of my work on an under powered sub-par table saw that I could never seem to get to cut true, which seriously hindered my work and always played a factor in which woodworking projects I would take on. Always avoiding anything intricate that required a lot of accuracy. So I was finally fed up and began my search for a proper table saw, comparing all of the major brands. At first I was looking at hybrid saws which seemed to suit my level of woodworking, but I decided I wanted a saw that was powerful enough and accurate enough to fulfill my needs has my woodworking progressed. So a 3hp - 5hp cabinet saw is what I needed. I knew nothing of Grizzly at first, but every time I would read forums, reviews, or watch videos about a certain brand table saw. The grizzly name would always pop up in the following thread, so they were definitely a brand to look into. I found that grizzly cabinet saws offered the same or similar specs, and warranty at half the price of competing companies saws. They are a tried and true company. Lots of people own their tables saws and everyone loves them. I also read a lot of reviews about how good their customer support is and that is important to me. So it came down to the Grizzly G0690/1 and the G1023 series saws. 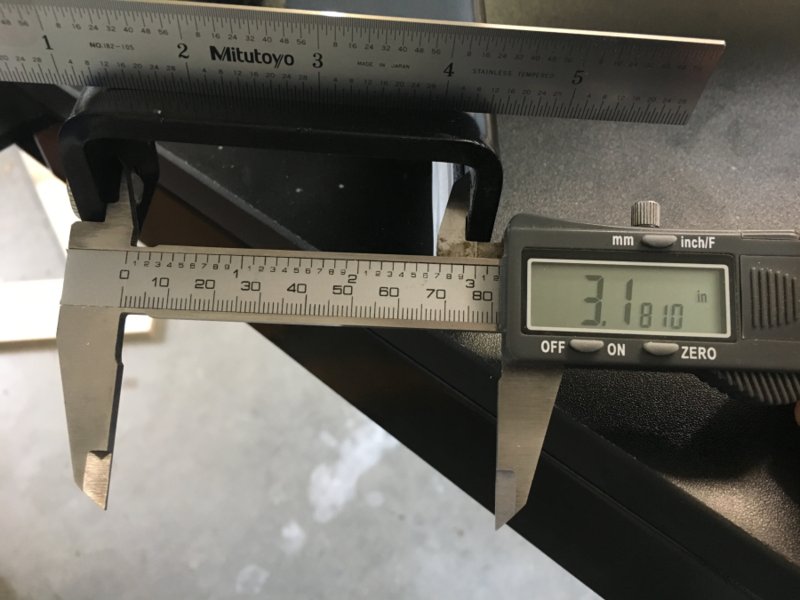 I placed a few phone calls to them over a couple of days to find out information like the distinct differences between the 0690 and 1023 saws and things like shipping and warranty information. Which the rep or product specially always happily answered for me. After dealing with their customer service people I was sold. I new I was purchasing my saw from them because of the great support. I just still didn't know if I wanted the 0690 or 1023. Since there were no real significant differences in the 2 saws that would make me regret buying one over the other. Ultimately I chose the G0690 because it just looks better to me, and it has slightly more cutting capacity in every aspect. Not a lot more, but some. I ordered the saw along with a couple zero clearance throat plates, the ShopFox mobile base, and the lift gate service. I ordered the saw on a Wednesday and I am thinking with such a large item that weighs over 500 pounds shipping freight it probably wont ship until the following week sometime and I wouldn't receive it for a week after that. Boy was I wrong. To my surprise Grizzly's shipping department is just as great as their customer support. The saw shipped the next day which was Thursday. I received a phone call from the freight company on Friday saying the saw would arrive to me on Monday and all I could think was wow. That was fast. The saw arrived to me on that Monday and I was excited. The saw and all of its component were well packed inside of 3 boxes. I unpacked all of the boxes and laid everything out to make sure it was all their. The cabinet of the saw itself is packed with some of the saws components. So dont forget to look their if you purchase this saw. First thing you notice is how detailed the manual is how easy it is to follow. They even give you instructions on how to build a few different accessories for the saw. So I followed the directions on assembling the saw which took me about 6 hours over the course of 2 days. Probably could have done it faster, but I wanted to make sure it was all perfect the first time. As this saw and some of its components are heavy. I didn't want to have to go back and do anything over again. I did have to shim the wings at the bottom edge of their matting surfaces with a piece of masking tape in order to get them to sit perfectly flat with the main table. This was easy to do and is outlined in the instruction manual. After assembling I checked the blades alignment at 45 and 90 degrees to the miter slots with my saw gauge which was surprisingly well with in tolerance. It was only off by about .003" which you just can ask for better out of the box. So I didn't need to do any adjustments their. The fence itself was about .011" off. So I again used my saw gauge and was able to get the fence to with .002" in no time. The fence is quite easy to adjust and I have not had to make any adjustments to it since. When you first power the saw on you will notice how quiet this thing is. You could literally have a conversation with someone while the saw is running, though I do not suggest doing so around running power tools. Since I have had the saw I have put it through its paces. Cutting everything from thin to thick stock softwood, hardwood, plywood, and melamine. This saw is true to every one of its 3 horsepower because nothing I have run through it has made the thing bog down. The riving was a bit difficult at first to install and remove as as the clamp that holds it is a bit tight, but I have noticed it loosen up a bit over time and becomes much easier to install and remove it. The fence rails and the the fence itself are a quality made, heavy, and robust build. Its a really nice setup. Though the blade guard looks really nice; I have never actually installed and used it, as quite frankly I never use a blade guard. Not that I recommend not using it to others. I just never use one myself. There is no shroud around the blade itself so the saw does drops to the bottom of the cabinet. The hold for the dust collection sits a couple inches above the bottom of the cabinet so you will notice the saw dust pile up in the cabinet a couple inches until it reaches the dust port, but with dust collection the saw dust will never get higher than the dust port itself. This is not great, but its just fine. I actually knew this going in as the Grizzly product specialist informed me that the 1023 series has better dust collection because it has a shroud around the blade while the G0690 does not have that. The miter gauge that comes with the slots is made of heavy cast iron and was fairly accurate out of the box. The miter slots themselves are perfectly straight. All in all I see why so many people love this saw. It is just an awesome tool. One thing I really love about this saw is the fence rail is made in such a way that it makes it is perfect for supporting the leading edge of an out feed table with out hindering the fence movement. Now I do not know if this was intentional or just a coincidence, but either way its a nice feature. My only gripe about this saw is how short the power cord is. You only get about 6ft which is just to short unless you have a 220 volt outlet in your floor next to the saw which most people do not have. So I made a 10 foot extension cord out of 12/3 SJOOW cable. Speaking with an electrician before hand they assured me that a 10 foot extension of the proper gauge would cause a significant drop in voltage that would lessen the life of the saws motor. This isnt a gripe, just something to be aware of. One of the mounting holes on the fence rail for the magnetic switch was stripped out. It was a simple fix. So I didn't bother calling in to Grizzly about it. I just used a tap to re-thread the hole and wallah. Problem solved. Also the main throat plate that came with my saw was slightly bowed in the middle. Flushing the edges of the plate with the saws table; the middle of the plate would always sit up higher. It doesn't throw off my cuts or hinder work in any kind of way so I still use it. I just chalk it up to something that just slipped passed their quality control, because the zero clearance plates I ordered with the saw, and the dado plate that come with the saw were perfectly flat. The only thing that I would change about this saw is the clear indicator on the fence for measurements. It would be nice if it had the convex sight in it to make reading the measurement easier. Also Id love to see grizzly produce 36" rails for this saw. Standard cabinet heights are 34.5 inches so 36" fence rails would be the perfect accommodation. As it stands you have the choice between the 30" rails (GO690) or the 50" rails (G0691). All of the things I listed above are small potatoes which would definitely not affect my decision to purchase this saw again. 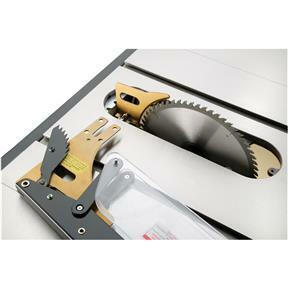 As it is a great performing saw and has to be the best value cabinet saw on the market. I have a huge grin on my face every time I use it. I received my saw yesterday, and have yet to use it. I will write a review of the tool once I have been able to hook up my electrical and put it to use. When I received the saw, the carton was in perfect condition. Total shipping time was 1 week, and I am in a semi-rural area of Colorado. While assembling I found that I was missing the knob to keep the access door closed, and there was a small (very small) dent in the particle board table extension. I contacted Grizzly customer service this morning through email and attached a picture of the damaged item, along with the part numbers for the knob and table extension. About 6 hours later I received a phone call, and email, telling me that replacements had been shipped and I should receive them in 3-5 days. This saw is my second major Grizzly tool purchase, and they have definitely earned a customer for life. Their products are outstanding, and the customer service is second to none. In my opinion, a company shows their true colors when there is an issue, and Grizzly has shown that they are beyond comparison. I can't believe that is has now been 6-years since I bought my G0690. This was my first Grizzly machine and I continue to love it to death! I added the cast iron router extension, PLUS reused the OEM right extension for a solid cast iron table without having to use the original sheet metal extension. WOW! That really made this an amazing machine. Mounted on a Grizzly mobile base makes it a breeze to move when needed (doing sheet goods). I had to drill matching holes to reuse the stock extension with the cast iron router extension but that was easy and well worth the effort. As far as the fence, it is great and works very well with the Grizzly adjustable Yellow Board Buddies anti-kickback wheels. I have been so impressed with Grizzly, that I have also added a Grizzly 8in planer and a 20in drill press! All continue to surpass my expectations and perform admirably. I recognize the names of other fellow woodworkers, from WWing blogs and share their positive impressions of this particular tablesaw. This saw is a keeper, and I do not think that I will ever have a need to replace it. Thanks Grizzly! I was using a contractor table saw for my 2-car garage workshop and thought it wise to purchase an upgraded cabinet saw. One friend has a hybrid SawStop, and another has a Laguna. I was jealous of their great running machine. However, I decided to shop around and research all table saws-my wife was going to kill me on any amount I spent to upgrade. I am not a professional and have not been woodworking very long, so this was the first time I have every heard of Grizzly. I was attracted by the low price and reviews of customer service. I decided to purchase the G0690 with mobile base. Grizzly ships by freight, so your shipment will arrive in a few boxes on a tractor trailer. This is not an issue if you live in a normal residential area, however, I live in a gated complex. This did not seem to bother the driver; he stopped outside of my gate and pallet jacked it around the corner to my garage (Set up over the phone 30 minutes before arrival). I do have to give praise to Fedex freight; they were amazing, and they saw shipped faster than the approximate delivery date. Putting it together was not as bad as I was expecting and my wife and I put it together in a couple hours. (You need 2 people!) The table shipped with great accuracy from the factory; I made very minor adjustments to the fence and fence rail. I have been using it for almost 2 months and cannot be happier. I LOVE THIS TABLE SAW!! It cuts through hard wood like butter and I noticed that all of the inaccuracies I was having on my previous contractors saw was due to quality. This machine, as with all grizzly products, are built with quality. I used the factory blade for a couple weeks and switched it out for a Diablo. This is the best investment and upgrade I have made to my garage workshop and I am out there everyday working on something. I recommend this saw to any amateur and professional woodworker. You cannot beat the quality for this price. I heard some talk about the accuracy of the fence measurement reader and how it was lifted too high from the tape measurer on the fence. I noticed the same issue, and decided to mount the reader on the underside of the fence to make it more flush with the ruler. It works perfectly and now very precise (no special tools required, just screw it in from the bottom). I cannot say enough good things about this table saw. My only complaint is my own dust collection set up. I am using a shopvac with Dust Right separator, and I am noticing it is not collecting the dust like I would want it to. However, with the cabinet saw, the dust will still collect inside the cabinet. Does anyone have any tips, or should I just upgrade to a better dust collection system? I do not want the motor to be affected down the line if I do not correct the problem. As with most of us, I shopped the internet and various stores for a couple of months trying to decide which saw would be best for my small hobby shop. I'm an after-work and weekend project kind of guy, but the table saw is involved in each project I am involved with. Knowing that this saw would probably be an "over kill", I decided on G0690 and placed the order. First, Let me tell you that this thing is well packed and is a BEAST to move around prior to the set-up. Invite a couple of your best friends over to unpack the thing and help you with the set-up. If you have the option to do the off-truck delivery, spend the money and do it. It weighs over 500 pounds. Also, Buy the optional wheel dolly to move it around the shop. It is well worth it. The set-up was very straight forward, and only took us about 3 hours. (including beer time) As we assembled, we checked squareness of the blade and smoothness of the table several times after each task. The Blade squareness, and the angle adjustments were SPOT ON without any changes. The only set-up adjustment needed was in the fence--only because I am picky. I also added a 48 inch out feed table to the back side of the saw. Sorry Grizzly, but I made new 3/8 in holes to the rear angle bracket of your brand new saw to accommodate this. Since I've never had an out feed table, I didn't know what I was missing. DO IT if you have the space!! I can take a sheet of plywood to the table saw, and rip it alone. I also have much better control of the smaller pieces going through the saw. Well, only about 2 weeks after the set-up project, one of the "Friends" who helped with the set-up called in the favor. He pulled down several rough-cut 5/4 Maple boards that had been in his shed for well over 20 years. They were in various degrees of "straightness" and he asked if we could get them ready to build some side tables for his sofa. Time to test the saw. OMG, what a saw! Please understand that I'm not used to this level of performance, but--- I pulled out all of my home-made straightening jigs, ran the boards through the saw, and it it didn't even know it was working. It is quiet, has No Vibration and will take anything you give it--even ripping 3 inch rough cut oak boards with no change in RPM. It is like a hot knife through butter. Purchased 4 yrs. ago. I use it nearly everyday and it has held up very well. I do a lot of continuous cutting and I have never had any problems with it. Well, I have finally used my saw enough to do a proper review for you. 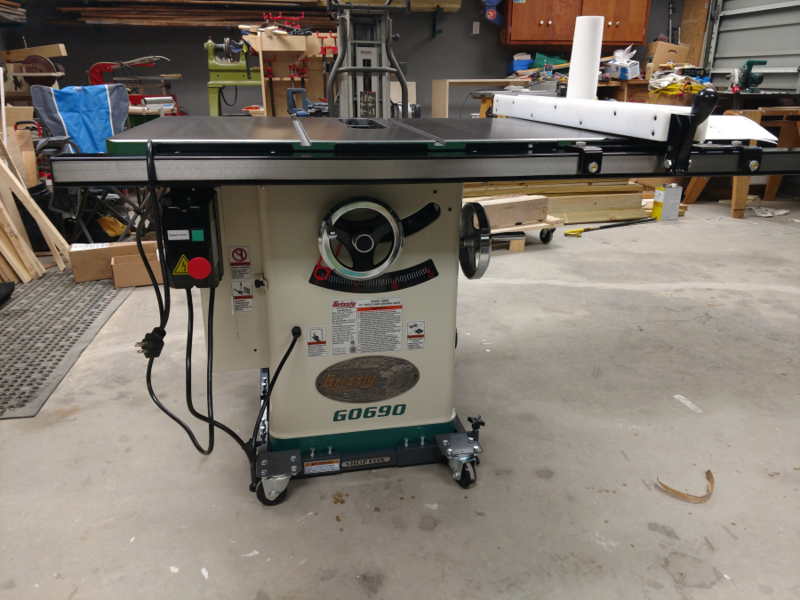 As many of you know...I did some up-grades in the shop.....with a new 8" Jointer, http://lumberjocks.com/reviews/705 , A new 15" Planer http://lumberjocks.com/reviews/755 , a new 17" Band saw (No review yet) and a new Cabinet saw. You can ask A1Jim, Todd C., Lenny and a few others....I about drove myself and them insane trying to decide what saw to buy...at first I was looking at a Steel City with a titanium top.....but I decided against that. I then narrowed it down between this saw, and a Powermatic PM2000...and with as many new tools as I bought...every penny counted. Let me start off by saying.... "I LOVE THIS SAW" ...assembly was a breeze....Nickle test ??? Try a "Pocket" full of nickles....I lined up 12 of them and fired it up, not a one fell, then I turned it off, got some wood, fired it up again and made a few cuts...and again nothing fell. Power ??? after years of using a contractor saw and one wore out unisaw...I really did not know what to expect....but it passed any expectations I may have had. For the last week and a half I have been shoving 2" thick mahogany, red oak and maple through it....and I may as well been pushing paper through it. This thing sounded like a jet engine starting up in my shop...not in a bad loud way...just sounds powerful. It has a great quick connect riving knife and splitter, just pull a pin, pull it out, switch them or put one in...all in about two seconds. The trunnion in this thing is a MONSTER...and I mean BIG....those cast wheels for adjusting...smooth as butter. Once you get it going, you can give it one good spin and it will almost free wheel all the way the other direction. The cast iron top is so smooth and shiny it almost looks like a mirror, (In the second picture...that is not rust...but the reflection of the yellow box on my radial arm saw...now that's like a mirror). It comes with a factory blade insert and a dado insert, I ordered a zero clearance insert for it when I bought it ($26). 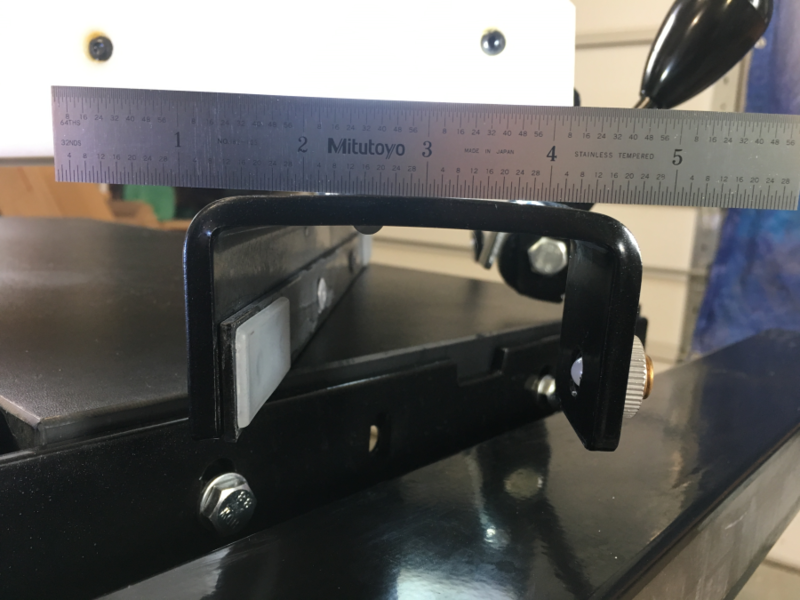 While I will upgrade the miter gauge in time when I find one I like on sale, the factory miter gauge is actually pretty good and can be adjusted to take out all play in the T-slot miter tracks. The fence, after a little adjustment, is straight as an arrow when wood is ran through the blade and down the fence. There are MANY and I mean MANY good saws out there for almost every price range. But if you're looking for a power house of a saw...loaded with extra bells and whistles (But not so many that it is a pain) that cuts very true and accurate...I recommend trying out the new Grizzly G0690. I am pretty sure I just bought my last saw !!! Edit: I forgot to add, the only tools you will need for this saw is a Phillips screw driver, a good straight edge, a 1/2 or 13mm wrench and socket and what ever you wish to use to align your blade, fence etc....Grizzly sends you almost every tool you need to assemble your tools....and while they may not be "Snap-on" quality..they are not punched metal either. You get a full set of long allen wrenches with a holder and a couple of wrenches with the saw it self, including two big heavy wrenches for blade changes. And then in each and every box, (Guard, fence, inserts etc) there is also the tools you will need to install just "That Piece"
Also, the directions say "Assembly time 1 hour"...lol...this may be true for a mechanical engineer....or if you want your square cut to be a triangle.....but plan on at least 5 to 6 hours of assembly time. I get a little "Obsessive" when it comes to trying to get my tools to a perfect tolerance...I know this is impossible with any tool...but I try anyways. With help, you can get this saw together and all the alignments done in about 3-1/2 to 4 hours....By yourself....between 5 to 6. 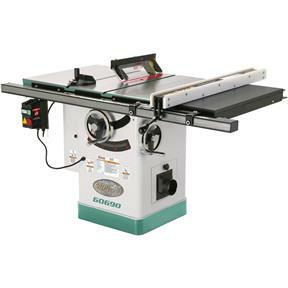 Q: What are the main differences between the G1023RL-Series and the G0690-Series table saws? A:Aside from color and outward appearances, there are 6 primary differences between these series of machines: the drive system, dust extraction components, switch lock-ability, blade guard spreader/riving knife release mechanism, the fence, and the country of origin. 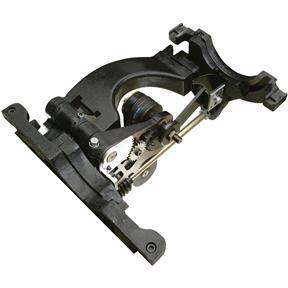 Q: What is the difference between the G1023RL-Series and G0690-Series belt-drive systems? A:The G1023RL-series features a poly-V "Serpentine" belt-drive system, which is quieter and transfers power more efficiently than a standard single V-belt drive system. The G0690-series features a triple V-belt drive system, which does a better job of maintaining a consistent transfer of power when under load than a standard single V-belt drive system. Q: What is the difference between the G1023RL-Series and G0690-Series dust extraction systems? A:The G1023RL-series encapsulates the underside of the blade with a dust hood that is connected directly to the dust port via an internal dust hose. This allows a dust collector to remove the majority of dust that falls through the table, and it helps keep the other components inside the cabinet clean. This system requires less cleaning and maintenance than that of saws where the dust falls straight through to the bottom of the cabinet. The G0690-series has a fully-enclosed cabinet with a sloped bottom that allows gravity to direct incoming dust toward the dust port. Q: What is the difference between the G1023RL-Series and G0690-Series mag switches? A:The G1023RL-series features a lockable mag switch with an included key-lock padlock. The G0690-series features a mag switch that can also be disabled from accidental use with a special pin, but it does not accommodate a padlock, so it can't be completely locked. Q: What is the difference between the G1023RL-Series and G0690-Series blade guard spreader/riving knife release mechanism? A:The G1023RL-series is equipped with a quick-release lever to unlock/lock the spreader/riving knife when changing between blade guards. The G0690-series is equipped with an easily-accessible knurled knob that unlocks/locks the spreader/riving knife with a quick rotation. Q: What is the difference between the G1023RL-Series and G0690-Series fence? A:The G1023RL-series features the hugely popular Shop Fox Classic Fence, which has been a customer favorite for nearly two decades due to its adjustment simplicity and performance reliability. The G0690-series fence is very similar to the Shop Fox Classic Fence in all ways, except that it locks against the front rail on three sides instead of two. 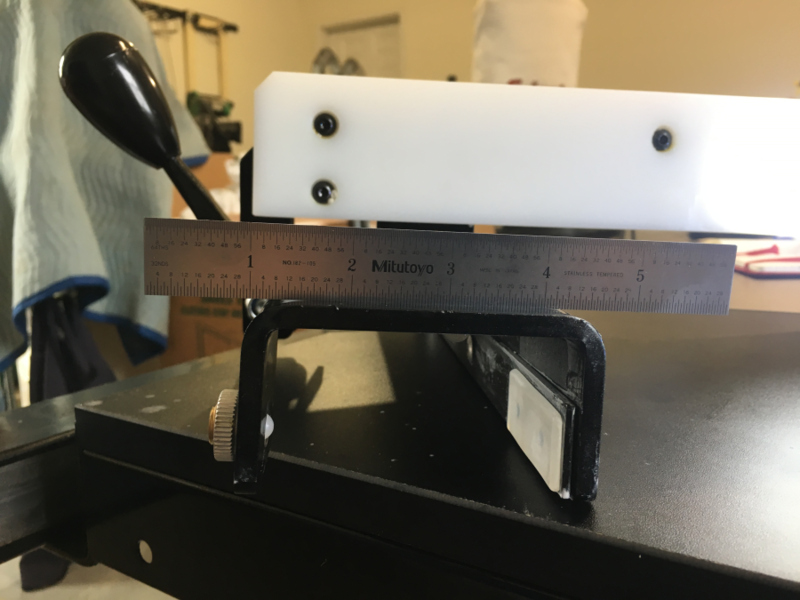 Aside from allowing it to lock more firmly in place, the added side of rail contact also provides an additional axis of adjustability when calibrating fence accuracy. 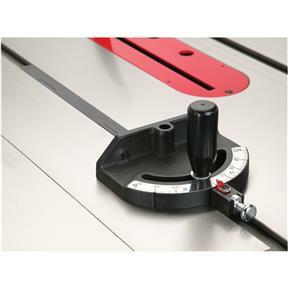 Q: Can I install an H7507 extension wing router table on this saw? A:Yes, but because the G0690/G0691 uses different fence rails than the G1023RL-Series saws, you will need to drill your own mounting holes in the H7507 to make it fit properly in place of the stock wing. Instead of going to all this work, we recommend getting the T10222 Router Table Extension, which was designed especially for this saw. Not only is this option much easier to install, but it also includes its own independent fence system, a starting pin, four miter slots, and an auxiliary support leg for increased stability. Q: How do I know which size of motor I'll need for my table saw? A:Assuming the correct blade is installed for any specific type of cut, the answer primarily depends on these three factors: (1) your average stock thickness, (2) your typical wood type or variety, and (3) your anticipated cutting frequency or overall demands placed on the saw. First, it is important to note that with a slow enough feed rate, any of our table saws can cut through a piece of hardwood up to that saw's maximum cutting height. Unfortunately, using too slow of a feed rate can result in burn marks in your workpiece, and using a feed rate that is so aggressive that it causes a motor to bog down will quickly increase the motor's internal temperature to a state of thermal breakdown. Once a motor reaches this state, continued operation (without allowing sufficient cool-down time between cuts) will result in the motor becoming so hot that its winding insulation will completely fail and the motor will die. A larger motor, however, could easily perform the exact same type of work without ever reaching a state of thermal breakdown. With that in mind, your goal should be to select a motor size that will handle the majority of what you'll be cutting on a regular basis, without bogging the motor down. To translate this into a more practical perspective, generally speaking, a 1.5 HP motor used with an aggressive feed rate can repeatedly cut 6/4 (1.5") soft woods and 4/4 (1") hardwoods without bogging down. A 3 HP motor, on the other hand, can repeatedly cut the same type of stock with the same type of feed rate at approximately twice that size without bogging down. Q: What are the differences between contractor, hybrid, and cabinet saws? A:A "Contractor" table saw is generally a light-duty saw with an open-stand and is usually equipped with a 1.5 HP to 2 HP motor that can be operated on a common 120V power supply, making it portable and convenient enough to take from jobsite to jobsite for carpentry work, trim work, and small cabinetry or furniture work. To keep the weight down, contractor saws often use sheet-metal wings instead of cast-iron wings, and their trunnions and other internal components use less cast iron or steel, making them much less beefy than those same components used in cabinet saws. A few other typical hallmarks of contractor saws are non-enclosed motors (making them slightly louder and sometimes resulting in a lack of dust collection) and trunnions mounted to the bottom of the table instead of the cabinet (making them slightly more difficult to align the blade to the miter slot or fence). The lighter-duty components used in their construction typically means that contractor saws also cost less than other saw types. The low cost, high portability, and convenience of operating on a 120V power supply, combined with included fence systems that often rival those used on cabinet saws, has historically made the contractor saw a favorite option for the hobbyist or beginning woodworker. 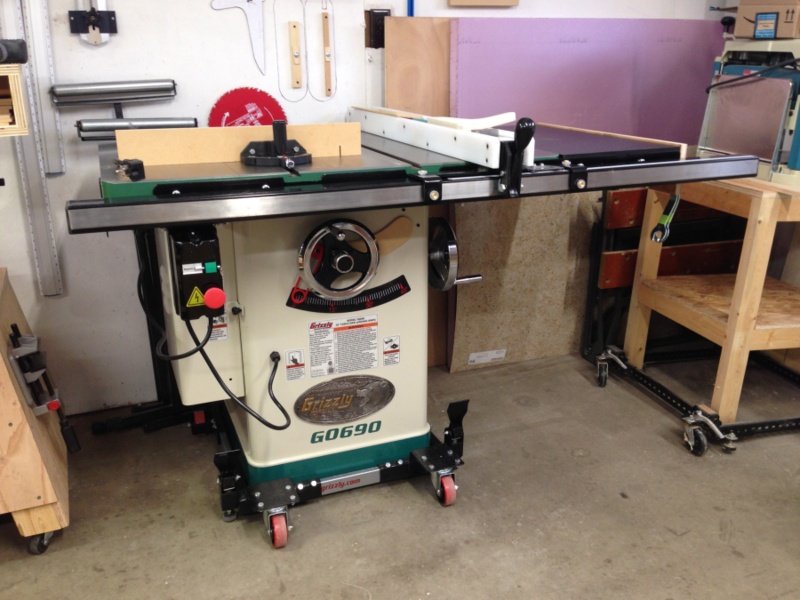 A "Cabinet" table saw is a heavy-duty saw with an enclosed cabinet-style stand and usually a 3 HP or larger motor that operates on a 240V power supply, making it the top choice for professional woodworkers, serious amateurs, or production shops that require day-in and day-out reliability and the ability to regularly cut thick hardwoods. 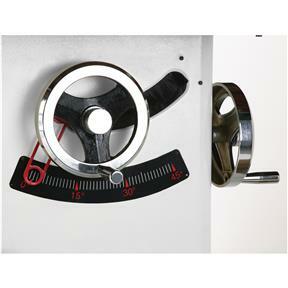 Unlike contractor saws, cabinet saws have much thicker castings for the trunnions and arbor assembly, which attach to the cabinet instead of the table (making blade alignment adjustments easier), and they usually have full cast-iron wings, which combined with the beefier trunnions and heavy cabinet stand, give them a lot more vibration-dampening weight. 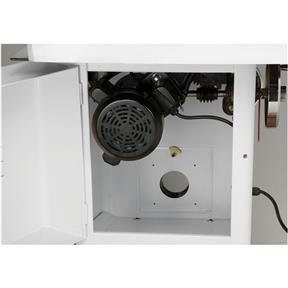 Additionally, the enclosed cabinet stands result in quieter operation and usually have much better dust collection. A "Hybrid" table saw is a newer category of saw that is considered to be a cross between a contractor saw and a cabinet saw. Like cabinet saws, hybrid saws typically have cabinets or stands with enclosed motors (providing quieter operation and easier dust collection) and trunnions that mount to the stand (making blade alignment adjustments easier). Like contractor saws, hybrids are generally constructed with lighter-duty components and materials (keeping costs and overall weight down), and they are usually equipped with 1.5 HP to 2 HP motors (allowing them to operate on a common 120V power supply). Because hybrid saws are often priced near contractor saws and they offer many of the additional benefits that cabinet saws provide over contractor saws, they are quickly becoming the saw of choice for the serious hobbyist or the professional woodworker on a budget. A:Blade choice is determined by the type and purpose of cut, hardness and thickness of stock, and desired trade-offs between cutting speed versus cut quality. Generally speaking, a blade with fewer teeth cuts faster but makes a lower quality cut, and a blade with more teeth cuts slower but makes a higher quality cut. We offer a wide variety of blades from a handful of different manufacturers. All of our blades are clearly designated by either blade function, cut type, or material type. Q: What is the purpose of the riving knife? A:The riving knife is used for non-through cuts. 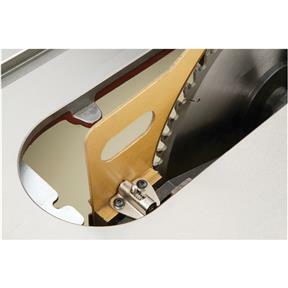 It is a metal plate positioned in alignment behind the blade to prevent the newly-cut workpiece sides from pinching on or pushing against the backside of the blade and causing kickback. The riving knife also acts as a barrier behind the blade to reduce the risk of hands being pulled into the blade if they are positioned incorrectly when kickback occurs. 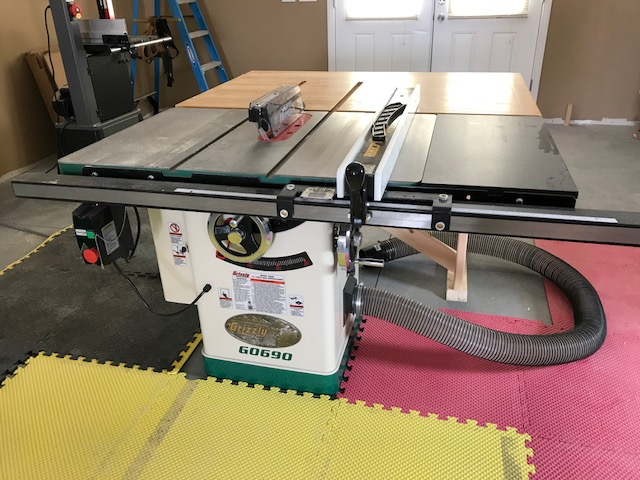 Q: Can I still use my table saw without connecting it to a dust collector? A:Yes, but we don't recommend it. Without using a dust collector, the dust will quickly pile up inside and around your machine, resulting in additional cleaning time later. Besides making a mess, fine dust can be harmful to your respiratory system. 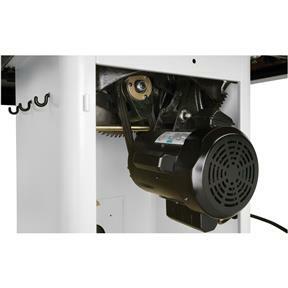 A better choice is to connect your table saw to a properly-designed dust collection system that at least pulls the recommended minimum CFM for your saw's dust port. Q: Can I cut metal or other non-wood materials with your table saws? A:Although our table saws will physically cut many different types of materials, they are only designed to cut natural wood or wood-based materials (plywood, MDF, OSB, etc.). 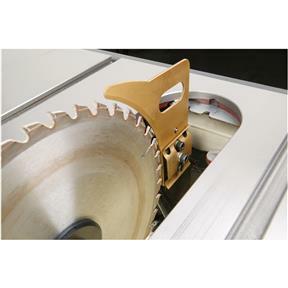 Cutting materials not intended to be cut on a woodworking table saw can result in serious injury to the operator or bystanders, and it could decrease the life of the saw and void the warranty.